Captain James T. Cox, a native of San Antonio, Texas, graduated from Stephen F. Austin University in 1982 and received his commission in January 1985 through the Aviation Officer Candidate School Program. Upon receiving his wings in May 1986, Captain Cox reported to HSL-31, the LAMPS MK I Fleet Replacement Squadron at NAS North Island. He subsequently reported to the HSL-33 “Seasnakes” in April 1987 where he served as Detachment Operations and Maintenance Officer, completing three deployments aboard USS KNOX (FF 1052), USS DOWNES (FF 1070), and USS JOHN YOUNG (DD 973). During his second deployment to the Arabian Gulf he also served as the Helicopter Operations Officer on the staff of Destroyer Squadron SEVEN during Operation ERNEST WILL. Between deployments he served as the squadron’s Assistant Operations Officer and Quality Assurance Officer, completing his first operational tour with over 1000 flight hours in the SH-2F. In January 1990, Captain Cox was ordered to the VT-27 “Boomers” in Corpus Christi, Texas where he served as a Flight Instructor, Scheduling Officer and Flight II Leader. In January 1992 he was selected to serve as the Primary Flight Training Officer and T-34C Standardization Check Pilot for the Chief of Naval Air Training (CNATRA). He concluded his Naval Air Training tour with over 1200 instructional flight hours. In August 1993, he reported for duty aboard USS ESSEX (LHD 2) where he served as the Aircraft Handling Officer and Assistant Air Officer during her maiden deployment in support of Arabian Gulf operations and Operation UNITED SHIELD with the 13th Marine Expeditionary Unit in Somalia. In August 1995 he reported to the HSL-41 “Seahawks” for transition flight training followed by a year of duty as an SH-60B flight instructor and squadron Training Department Head. In December 1996 he reported to the HSL-51 “Warlords” in Atsugi Japan where he served as the squadron’s Operations Department Head and Detachment FIVE Officer-in-Charge, deploying aboard USS THACH (FFG 43) and USS RODNEY M. DAVIS (FFG 60). In October 1998 Captain Cox was assigned to the staff of the Deputy Chief of Naval Operation (Manpower and Personnel) (Nl) in Washington, D.C. where he served as the Head of Officer Promotion Plans and the Deputy Branch Head for Officer Plans and Policy. In January 2002 he reported to the HSL-43 “BattleCats” as the Executive Officer and assumed squadron command in May 2003. In September 2004 Captain Cox reported to USS PELELIU (LHA 5) as Air Officer, deploying to the Arabian Gulf in support of Expeditionary Strike Group THREE. He subsequently attended Joint Forces Staff College and was selected for Major Command at Sea in September 2006. He was subsequently assigned to United States Northern Command where he served as the Maritime Future Operations Branch Chief and Deputy Chief, Future Operation Division, J35. Captain Cox reported as Executive Officer of USS PELELIU (LHA-5) in September 2009 and assumed command as her twenty-first Commanding Officer on 18 December 2010 until 22 June 2012. 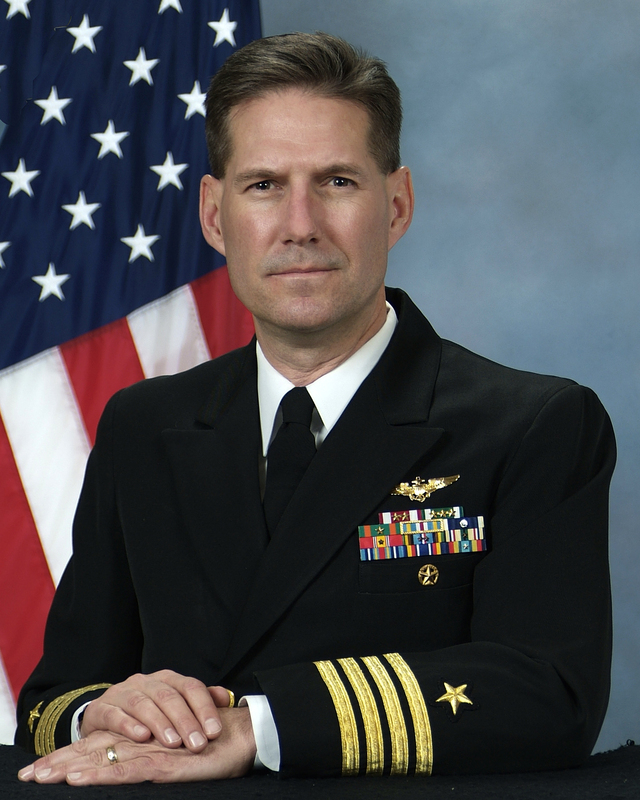 He subsequently served as the Deputy Requirements Officer for Commander, Naval Air Forces and retired 31 July 2014 after 30 years of service in the U.S. Navy. Over his 30-year career Captain Cox accumulated over 3500 fixed and rotary wing flight hours and performed over 800 small deck landings. His personal awards include the Defense Superior Service Medal, Legion of Merit (2 Awards), Meritorious Service Medal (3 awards), Navy and Marine Corps Commendation Medal (4 awards), Navy and Marine Corps Achievement Medal (2 awards) and various campaign, unit and sea service related awards.